Cairo, the current capital of Egypt and the largest city in the Middle East and Africa, has been a major cultural, religious and political center of the Arab, Islamic and African worlds for centuries. The year 2011 saw unprecedented civil and political upheaval in the city, as the world watched young citizens raised in poverty take over Cairo’s public streets demanding a change in the country’s 30-year political dictatorship. The city covers about 175 square miles on both sides of the Nile River. Its location, where the Nile Valley of Upper Egypt and the delta of Lower Egypt meet, has served as a major trade passageway for water and land trade for five thousand years. The Fatimid dynasty founded Cairo proper (“Al-Qahira”) in 969 C.E. as a royal city alongside al-Fustat (“tent city”; the Muslim Arabs’ earlier settlement), which was at the time the country’s commercial and residential center. Al-Azhar, the most important Islamic institute in the world, was built as a mosque-university under the Fatimids. It was also under their rule that the centers of power in Egypt gradually shifted to Cairo from al-Fustat, which was burned in 1168 C.E. to repel a Crusader attack. Saladin (Salah al-Din) established the rule of the Ayyubids in 1171 C.E. after his army defeated the Crusaders. Five years later, construction on the hilltop Citadel, a military fortress and residential palace, began in the southeast of Cairo. Cairo during this period became the seat of Egypt’s economic, political, and cultural life. The Mamluks chose the city as their capital in the thirteenth century. Their dominance brought Cairo great prosperity and world renown, with its spice trade, universities, courts, schools, and flourishing artistic and intellectual landscape. A steady decline began after the bubonic plague ravished the city in 1348. The spice trade was rerouted by Vasco de Gama, eliminating Cairo as its dominant corridor, and the Mamluks were increasingly engaged in internal wars. The Ottomans seized the weakened city in 1517, making it a provincial capital. Muhammad Ali was appointed Pasha in 1805, presiding over further stagnation as epidemic disease spread. Alexandria meanwhile experienced two economic booms fueled by cotton exports. Throughout the nineteenth century, Alexandria became the financial and political center of Egypt while Cairo stayed the political capital. Reform did occur however after Ali’s rule ended in 1850. Lower mortality rates, urbanization and mass immigration defined the era, as well as the construction of the Alexandria-Cairo Railroad (1855) and the Suez Canal (1869), which accelerated movement. The Egyptian Republic, established in 1952, saw the end of a three-decade European dominance of the city’s political and economic affairs. Gamal Abdel Nasser instituted land reforms, urban development, nationalization of private concessions in utilities and transport, industrialization, and extensive public investment. 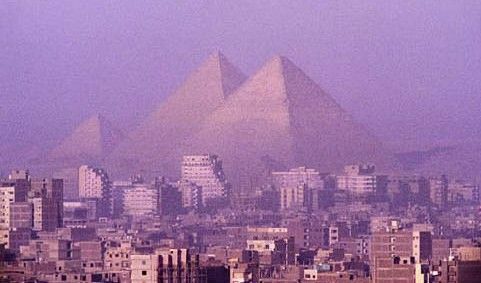 Cairo was a major base for Third World and pan-Islamic groupings in this period. At the beginning of the twenty-first century, Cairo’s metropolitan population exceeded 17 million. It is considered the commercial and industrial center of Egypt, the cultural capital of the Arab world, and a landmark of historical and cultural sites. It also holds publishing houses, modern universities, a cultural industry, playhouses, and a new opera house. Under Cairo’s impressive possessions, historical and present, is also a city where unemployment, pollution, sprawl, and unchecked overpopulation remain dominant and persistent issues for its residents. In January of 2011, young residents of the city took over the downtown public squares in opposition to decades of poverty and oppression. After weeks of unprecedented protests that gained international media coverage, the country’s long-standing dictator-ruler, Egyptian President Hosni Mubarak, was forced to step down. “Cairo, Egypt,” in Kwame A. Appiah and Henry Louis Gates, eds., Africana: The Encyclopedia of the African & African American Experience (Oxford; New York: Oxford University Press, 2005); “Cairo (Al-Q?hira),” in Joan Wucher King, Historical Dictionary of Egypt (Metuchen, N.J.: Scarecrow Press, 1984); “Cairo,” in Philip Mattar, ed., Encyclopedia of the Modern Middle East: vol. 1 (Detroit, Mich.: Macmillan Reference USA, 2004).